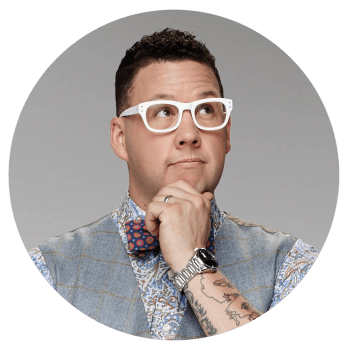 Graham Elliot: One of the world’s best chefs, but also one of Chicago’s. I’m totally bragging: I love that his roots are in my home town so I can enjoy his restaurant (when we splurge) without prefacing it with, “Going to eat at that place is on my list when I travel to…” There is something about his way. He’s got confidence, sure, but there is this down-to-earth vibe, despite him having accolades that would allow him to be opposite of a nice guy. So, that is probably why my daughter became such a fan of his: she loved MasterChef Junior from the first episode, which further drove her to love the art of cooking. When I ordered Graham’s first cookbook Cooking Like a MasterChef for her as an early Christmas gift, she literally welled up with some tears upon receiving it. “What should we make first?” was the first thing that came out of her mouth after the “thankyousososomuchiloveit” and hugs. 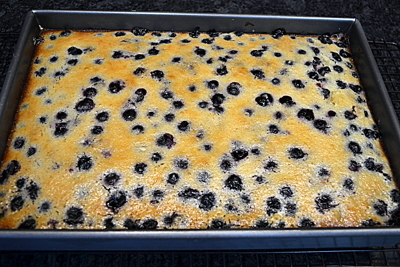 Well, all of my suggestions were sort of placeholders until she flipped open the page for the Lemon Blueberry bars. For those of you who don’t know, I don’t dig baking. Or crafting. But I can’t deny her the first choice in our culinary adventure with this book. So I scan the recipe, declare that I can easily shift it to to be gluten free for her, adapt it a bit to adhere to the ingredients we had on-hand, and decided we’d bring them as our dessert when we visited my aunt and uncle’s home the next day. These would be fantastic for an Easter brunch, Mother’s Day breakfast, or a summer BBQ. 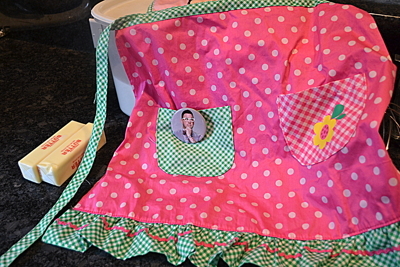 My daughter’s apron–the GE button is always on. We started out by gathering all of the ingredients, and I gotta say: it’s pretty difficult to look at and smell lemons and not feel a little more chipper. The main element in this recipe that we needed to tweak for the gluten was the flour. Easy. 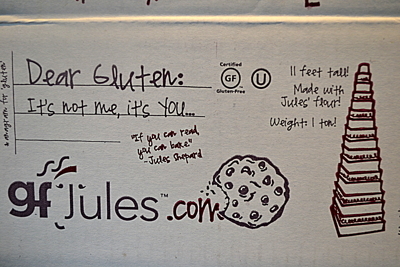 I love using Jules’ Gluten Free blend. This stuff is amazing to work with. I’ve done perogie dough with it, cookies, pie crust as well as pizza crust. It has all the key GF components (all the starches and xanthan gum) required and measured out perfectly. The last but arguably most important ingredient to gather was my radio and iPod. I cannot cook, bake, clean, eat, read, write or breathe without music. 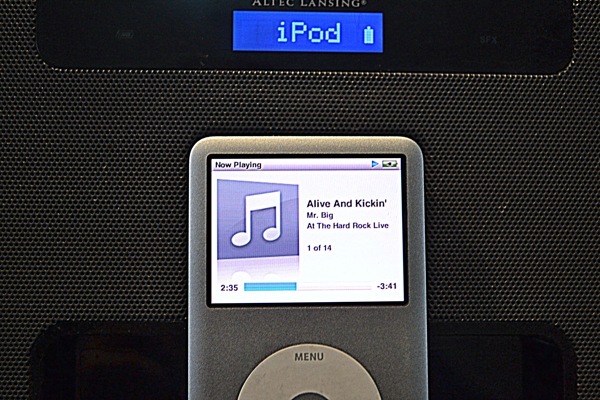 This recipe seemed to scream “jump in, head-first!” to me, so I pulled one of my all-time favorites, Mr. Big–Live at the Hard Rock–and we jumped in, Alive an’ Kickin’! Preheat the oven to 350. Add butter and sugar to a mixer (or use a hand-mixer) on medium speed for a few minutes until it’s completely blended and fluffy. Add flour, coconut, and salt on low speed until things are combined. On a floured surface, form the dough into a ball, tehn place it in the center of a 9X13 baking pan. Be sure the dough is evenly spread, and you’ll want to go up about 1/2 inch on the sides. Take the time to work out the hills or the valleys now so the crust bakes evenly. While that’s chilling, clean out your bowl, or use a new mixing bowl. Whisk eggs, sugar, flour, zest and lemon juice until blended and smooth. If the crust has chilled for 30 minutes, put it in the oven now for 15-20 minutes until very light golden in color. Cool on a wire rack and leave the oven ON. 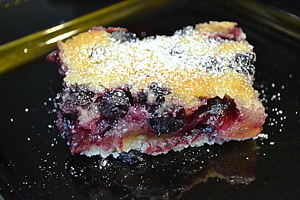 crust after baking–leave that oven on when this is done. 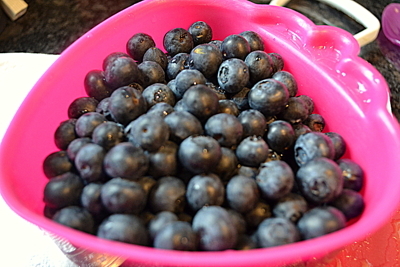 Stir the blueberries into the batter carefully, trying not to break them up. Pour the batter into the crust and bake for about 30 minutes until the filling has set like a custard. 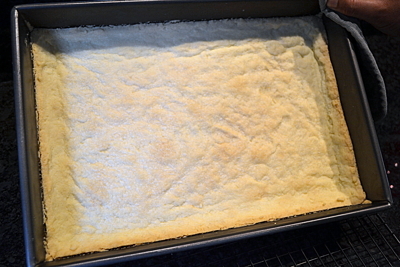 Cool the bars in the pan, dust with powdered sugar if desired, and cut into squares. These look delicious! I don’t like coconut. Could the crust be done without it? What adjustments would need to be made? Thank you! Hi Michele! Thanks for the compliment and great question. Yes, these can definitely be made without the coconut. 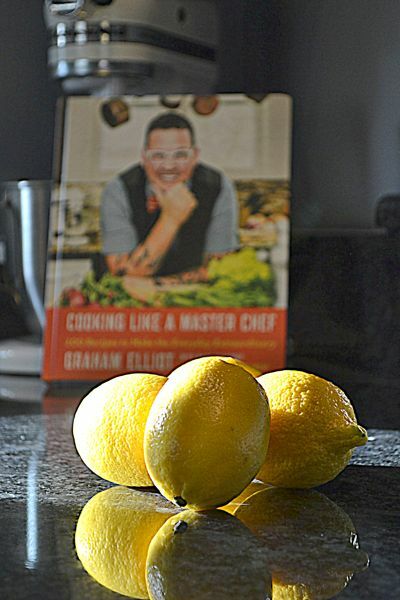 In fact, the recipe is by Graham Elliot and he does NOT use coconut in the original recipe. You won’t need to adjust anything on the recipe: just remove the coconut. This looks so good. And I LOVE her Graham Elliot button.